I have guided on Lay Lake for over 30 years. Fished bass tournaments for the last 25 plus years on Lay Lake. You could say, I know this lake. I also know from my many memories, big bass pictures and my many past fishing logs, spring is the best time of the year to be fishing for bass on Lay Lake. Not only for numbers of bass but for targeting some of the year’s biggest bass as well, all while fishing in shallow water. No, not I’m not talking about fishing deep water (although both the Coosa River spotted bass and Lay lake’s largemouth bass are there year round), I’m talking about dabbling all your new bass lures in Lay Lake’s waters, usually featuring depths of less than five feet. Lay Lake has loads of aquatic weds, many types of rocky habitat for fish to relate to and a variety of wood cover (with many of these types of bass holding cover in water less than 5 feet deep), for anglers to target this spring season. It is a known fact, no mater what time of the year you fish Lay Lake. It does take certain lures to fish each piece of fish holding cover. 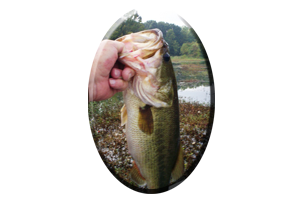 So, from March on into April (and all throughout the merry month of May), these are very catchable bass.That is generally, with today’s very knowledgeable bass anglers, – bass that most any angler can fool into biting their tempting offerings. However, lure choices are many (just visit Marks Outdoors in Vestavia, Alabama or see online at; www.marksoutdoors.com ) and see how today’s lure arsenal can be mind boggling, especially for newer anglers to the sport. 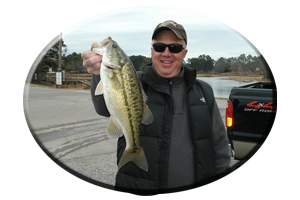 Spring time fishing patterns and various fishing locations are many, especially on Lay lake, with over 50 miles of navigable waters, from dam to dam. Anglers must also take into account such things as the weather, baitfish locations, water temperature, water clarity and even the condition of Lay Lake’s various types of aquatic weed growth. 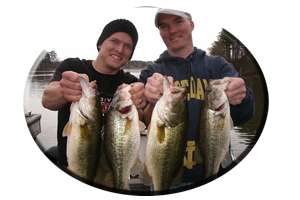 These and many other variables can all figure into this springtime excursion, as you seek out both the largemouth bass and the Coosa River spotted bass of Lay Lake. Without listing every type of lure, various lure colors, lure sizes, lure designs, lure shapes and the ever growing list of today’s lure manufactures, I can offer some help. Here’s some suggestions for fishing Lay Lake on a month by month basis, for this spring’s prespawn bass, spawning bass and post spawn bass. Buying and trying all those new lures is up to you. 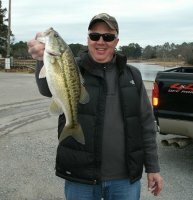 March can be deceiving even for shallow water, prespawn bass. Its all according to the weather. During week long warming trends, even in February and early March, these bass can suddenly move shallow. During severe cold fronts they may move back to the security of deeper water. Or some shallow bass simply bury up in cover or they may just even suspend above irregular bottom features in and around the shallows, until conditions improve. So like said, check the weather. Not only for the day you plan on fishing Lay lake but take note of the weather about a week prior to your planned trip. This is very important. It gives you a more mental look at the whole, overall picture. Rather than a just plain “feel good” look at the lake, like on warm sunny days, that tell you the bass should be shallow – but often most are not. I did say, most bass. Lay lake is a very odd lake at times. It must be something in the water. So never completely rule out your “gut feeling” that some bass are catch able in shallow water. Because most of the time, there is! Its just that on some days, especially during tough, early springtime prespawn conditions, there could be a whole bunch of bass located in one lone spot, in or very near the shallows – just waiting for you to discover. Things such as an all day sunshine warming the shallows can be a big factor in March. Cold nights often linger throughout the month of March. Overnight cold fronts can cool the shallows as much as 10 degrees lower than the preceding evening. Bass are prisoners of their environment. Their metabolism is slowed somewhat in colder water. So they do not eat as much when the shallows cool. Bass do not expend as much energy during cold front conditions, as they do during periods of warmer water, when the shallows can warm 5-10 degrees in a days time, increasing their energy level from mid day to late evenings. There are many factors here. Here’s a few to ponder, when considering the weather on Lay lake this March. Does the week long warming trend include both consecutive warm days and warm nights? If so, the water will cool very little each night and it can warm considerably with each passing day. Normal, warm sunny days in early to mid March on Lay lake can warm the shallows 5-7 degrees. As much as 10-20 degrees in one week! * There has been a week long, early March warming trend, with unseasonably warm nights and day temperatures in the mid-70′s. Water temperatures’s have been soaring each day, from 55 degrees to the upper 60′s by weeks end. A full moon is only two days away. Bass could be duped into thinking its time to begin their annual cruise towards the shallows. They may begin searching for a mate, maybe even begin preparing an early season bed for reproducing a new year’s offspring. * Note; This is a time when actually, two trips to Lay Lake during this week long warming period, can show an angler really loading the boat. First. After several warm days and nights these bass are induced to feed heavily with the constantly warming shallows raising their metabolism and providing them with loads of choices on the menu. More bass are in the shallows and more to eat on the menu. Second. Warming water not only excites the predator, but induces the prey to get more active as well. So baitfish, minnows, crayfish, worms, lizards, frogs, insects and small snakes emerge as well as spring progresses. Meaning a bass is more likely to hit your lures, a variety of those lures – that simulate these rather easy-to-catch meals. So always keep in mind, most approaching rainy fronts in March, bring a very warm day and warm night, at least for a day or two. As it blows through and the rain ceases, high winds follow, coupled with bright, sunshine and then an anglers nightmare…another bright, bluebird day. A cold front moves in and once again, the bass are shut down for a few days. Best places for early season bass? Its all according to other factors. Heavy rains can bring muddy water, creating a mud flow in major tributaries on Lay lake. Places you were catching bass in all week can be downright fishless during these times. So anglers begin their search for clearer water. This may be main lake flats, but not those right below the mouths of major feeder creeks. Usually the best places following several days of heavy rain is the mid to lower lake area during March and April. No, this is not about fooling bedding bass. Its about what to expect on Lay Lake in April when most bass are bedding or in shallow water feeding. You see, contrary to popular belief, not all Lay Lake bass bed at the same time. After all, do all female human beings have babies on the same day? Bass are triggered to find a mate, build a bed for their newly hatched egg offspring and reproduce each spring season…all by their surroundings. Warm water or cold water, moon faze, water clarity, even bottom composition and an available food source nearby, can often dictate their final choice for bedding purposes. So look around in April. Lay lake’s river-like headwaters may have spotted bass and largemouth bass not yet spawning, just eating. While mid to lower lake bass are bedding. Mid Lay lake could have clearer water, more available baitfish and much more suitable conditions for spawning bass found along main lake flats, flats in creeks and especially pockets and small cuts off the main lake (of which will muddy up less following heavy rains), places that many anglers ignore. Including, new growing aquatic weeds. Lower Lay lake could have weeds, stumps and rocks with late spawning bass nearby in late April, often on into early May. This is due to deeper water on the lakes lower section cooling slower and these are the last places bass bed in spring on Lay Lake. It could also be the clearest water in the lake following heavy rain. Keep in mind. One thing about clear water, it warms slower than stained water during the spring. Warming water brings greener weeds in April on Lay Lake. 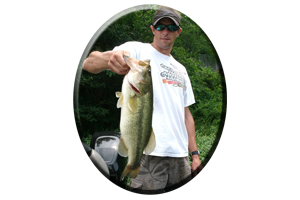 This oxygen-rich environment is the home of Lay lake’s shallow weed dwelling largemouth bass. These weeds provide security for most male and female bass in the shallows as they await a chance to bed. While holding along these weeds near a bed or even during post spawn times after bedding, they are very susceptible to your lures. Anglers can fool these weed dwelling bass, that can often result in some of Lay lake’s biggest bass of the year. Look for the greenest weeds early in the season for the most active bass and usually the bigger more dominant bass, that move in these weeds early in April. Also bring along a good net and net man. By now most anglers that frequent Lay Lake will agree. May is the best month to be on Lay Lake. Consistent action, big, hungry bass in the shallows coming off the beds and most big bass are way out of out of their normal character – acting very foolish while hitting topwater lures, spinnerbaits and weedless lures like frogs, rats, floating worms and lizards, soft jerkbaits and buzzbaits, including loads of lures fished on or near bottom. Often these bass of May attack your lures with a vengeance. Sharp hooks and strong line are suggested. Maybe at some time during the spawn, these big female bass have a brief memory of one of these little prey irritating them or trying to eat their eggs and now…its pay back time! Not only is May feeding time for the bass (before bass return to deeper water, bury up in thick, summertime weeds or suspend along the shallows for the summer), before spawning season comes to an end, but it is also feeding time for predators that feed on these bass. No not birds and alligators, I’m talking about man. By May every angler, boater and even jet ski will be on the water once again, so safety becomes the factor, instead of spawning bass. May is also when two of Lay lake’s biggest bass tournaments are held. * Our Lakes will be very crowded with tournaments, anglers and boaters as it warms. Be careful, be courteous and have a safe spring and upcoming summer this year. See more spring fishing tips for all of Alabama’s lakes. 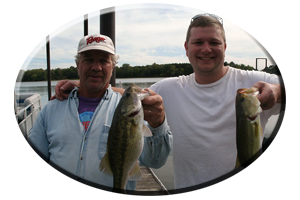 * In need of a fishing guide for spotted bass, largemouth bass or striped bass on Lay Lake? Or any Alabama lake year round? Always call on Reeds Guide Service.